Sometimes reinventing the wheel is fun. But when the wheel is just too good to need reinventing, there’s no need to fuss. I made white bean hummus this weekend. No innovations, no frills, no extra-special secret ingredients–just beans, tahini, oil, a few seasonings and a finger-sticking boatload of roasted garlic. Especially this time of year, especially in northern California, when the slowly intensifying sun and bottomless blue sky start seducing people outside to eat finger foods and play guitar on the grass, there’s a lot to be said for going back to the tried-and-true. Roasted garlic elevates just about anything it touches, but it especially loves hummus. The combination of sweetness, creaminess and nuttiness is one of the surest crowd-pleasers I’ve ever encountered. When it’s homemade, it’s even better–the garlic is sticky and caramel-like, the beans are silky and flavorful on their own, and using fresh lemon juice cuts the creaminess with bite. Chickpeas are traditional, of course, but white beans make for a milder hummus and let the garlic star. 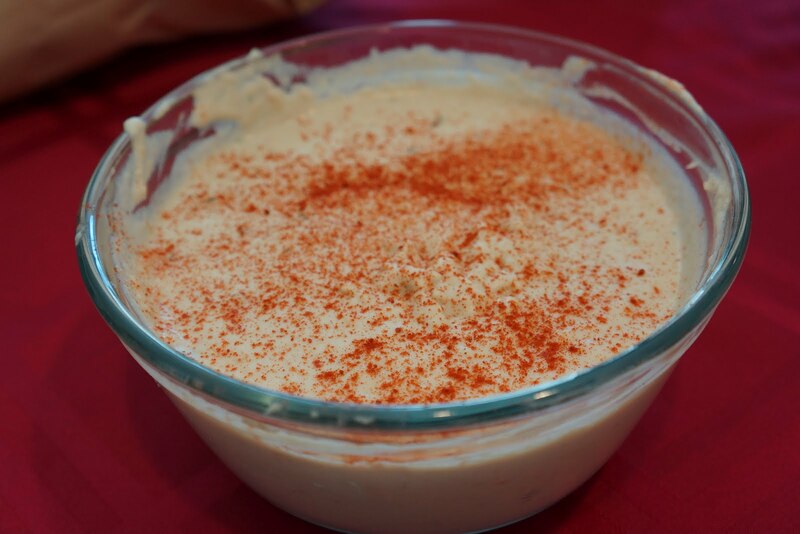 I like a simple mix of smoky-fragrant seasonings in my hummus–thyme, cumin, coriander, and a shiver of smoked paprika on top. I can think of no better way to kick-start the sunshine season than with a bowl of this stuff and a plate of dippable crunchy snacks. I’ve used soy sauce about a thousand and one different ways, but until recently I’d never thought to try poaching things in it. As it turns out, soy sauce mixed with an equal amount of water and spiked with the usual-suspect ingredients–honey, ginger, garlic, chili and scallions–makes a terrific cooking medium for a good piece of fish. Or, in my case, a mushy hunk of frozen salmon that had reached the use-or-toss point. This might have been one of the best-smelling dishes I’ve ever made. I kept leaning my head over the pan to get whiffs of soy and spice and ginger and garlic. As the fish poached, the liquid took on some of its meatiness; as a sensory bonus, it also tinted the fish a a soft wood-toned brown. 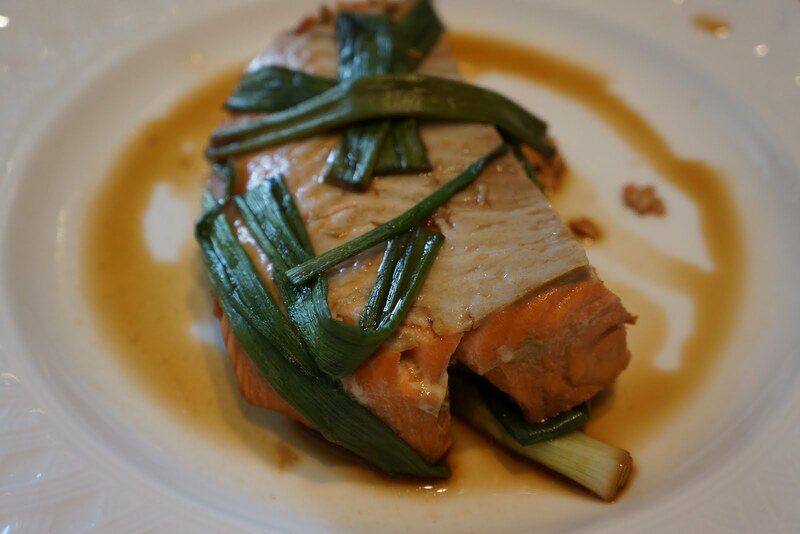 Once the fish was cooked, I was surprised at how subtle the flavors were; the flesh of the fish came through loud and clear, with the poaching liquid lingering quietly in the background. Sam and I ate the salmon on its own, with some of the liquid spooned over the top, but I wished the entire time for a fluffy pile of brown rice to drink up more of the spicy-salty-sweet sauce. As I said, I used salmon here, but this would be a terrific cooking technique for almost any fish. Mark Bittman recommends a firm-fleshed white fish: you could use striped bass, snapper, halibut, mahi mahi, or tilapia. If you prefer a richer-flavored fish, try catfish, mackerel, swordfish, trout or sablefish (aka black cod). Spring has sprung, and asparagus is everywhere. The farmer’s market stalls are lined with pointy green bundles, and every supermarket I’ve been to this month has asparagus on display. If you’re looking for seasonal green stuff to experiment with, this is your prime suspect right now. Truth be told, asparagus is not my favorite vegetable. I like the flavor just fine, but there’s something about the soft crunch of the stalks that doesn’t appeal to me. My favorite way to eat asparagus is not whole, or even chopped, but shaved. With a vegetable peeler and a few minutes’ work, you can turn the rubbery stalks into pale ribbon-like strands, thin enough that light shines through them. Instead of crunchy, the strands are silky and soft, and the flavor seems softer and more floral, somehow. Recently, I hit on a particularly nice combination: shaved asparagus, thin-sliced leeks and mustard on whole-grain flatbread. The flavors play gorgeously together–grassy asparagus, sweet leek, spicy mustard, nutty grains. After baking and topping the flatbread, I ran it under the broiler for a few minutes, just to char the asparagus for a little smoky crunch. It took a little experimenting to strike the right balance of textures–crisp on the bottom, chewy and soft in the middle, ribbony on top–but now that I’ve got it, it must be shared. I kept this simple–and, incidentally, vegan–so there’s nothing really holding the topping onto the flatbread. It’s a little delicate to cut into. If you wanted more of a sturdy topping, you could grate a little smoked gouda over the asparagus. 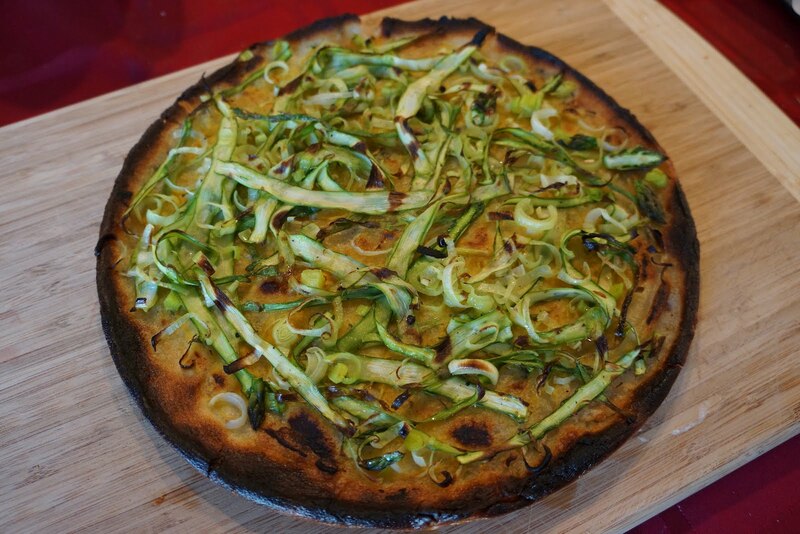 But I like it just the way it is–simple and springy and loaded with vegetable flavor. If you think you don’t like asparagus, then this is the asparagus recipe for you. Good things really do come to those who wait. About three weeks ago, I had the flu. By about the third day, I was going out of my mind with boredom. I wasn’t yet well enough to leave my apartment, but I had to do something productive. I had canned chickpeas and tomatoes in the pantry, a jalapeno and an onion growing elderly in my fridge. 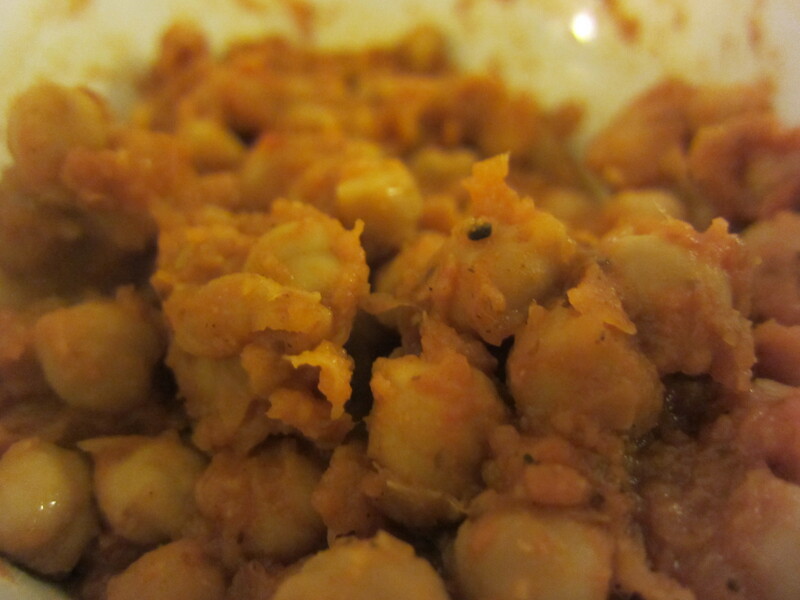 So I found a recipe for chana punjabi–Indian chickpea and tomato stew–and set about making it. I tasted as it was cooking, and it was…fine. Spicy. Indian. Warm. Generic. I was underwhelmed, and the flu had sapped me of my appetite anyway. So into the freezer it went, to wait patiently until I was well. Now I’m finally well–and very happy. After three weeks of sitting and flavor-melding, this chana punjabi is a flavor juggernaut. I’m sitting and eating it now, as I type. It gets better with every spoonful. The chickpeas are nutty and tender, bound lightly in an velvety orange-red sauce of tomatoes, onions and aromatics. Unlike chana masala, which is turmeric-heavy and speckled with chunky vegetables, this is rich and smooth and surprisingly subtle. I can only imagine how much more stunning it would be with home-cooked chickpeas. I will definitely be making this again. And absolutely letting it sit for a while before touching it. It’s worth the wait, believe me. Boy, do I have a treat for you. This past weekend’s Supermoon–the first full moon in May–marked the beginning of soft-shell crab season. And I have discovered the very best way to eat soft-shell crabs: grilled and slathered with barbeque butter. I’m almost reluctant to share, this is so good. 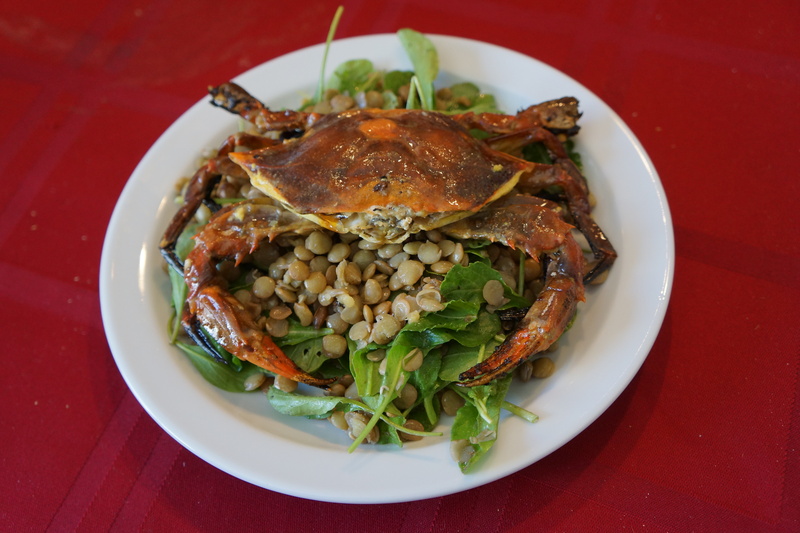 Soft-shell crabs are in season from May to September, mostly from the waters of the central Atlantic coast. This is the time of year that blue crabs molt, leaving them with nothing but a paper-thin proto-shell for a few hours at a time. If these crabs are caught before their new shells have a chance to grow, they are completely edible–exoskeleton and all. The thin shell of a soft-shell crab is crackly, almost like the crisp skin on a roast chicken; the inside is juicy, gooey, sweet and unmistakably crabby. If you can get your hands on these bizarre little beasties, you are in for a treat.